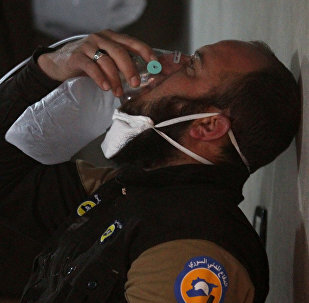 On April 4, a chemical weapons incident in Syria's Idlib province claimed the lives of some 80 people and inflicted harm on an additional 200 civilians. 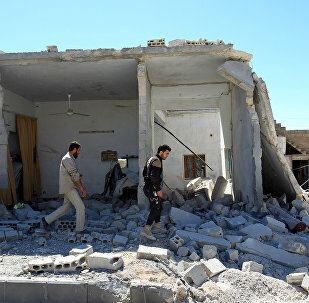 Damascus put the blame on militants and reiterated that it did not possess any chemical weapons. Moscow said a Syrian warplane in Khan Shaykhun hit a terrorist warehouse that stored chemical weapons slated for delivery to Iraq. A number of Western states blamed Damascus for the incident. The United Nations and the Organization for the Prohibition of Chemical Weapons (OPCW) started an investigation. The incident was used by Washington to launch a Tomahawk cruise missile strike against Syria's Ash Sha'irat airbase on April 6. Sanctions imposed by the European Union on Syria over alleged chemical weapon attacks by Damascus are ill-timed as investigators have yet to find evidence determining those responsible for April's Idlib attack, Gerard Bapt, a member of the French Socialist Party, told Sputnik on Wednesday. UK Foreign Secretary Boris Johnson declared on Monday that the European Union will impose sanctions against 16 Syrians over their alleged role in the chemical weapons use against the civilian population. 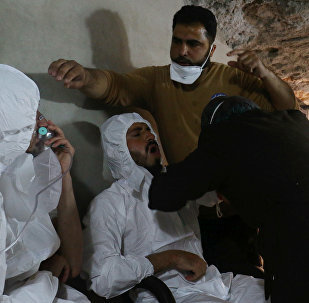 The United States' claim that a Syrian military aircraft dropped a sarin bomb near Khan Sheikhoun in April raises serious doubts, the Russian Foreign Ministry's nonproliferation department chief told Sputnik. The Organisation for the Prohibition of Chemical Weapons (OPCW) mission into April's chemical incident in Syrian Idlib has failed to establish what happened in the province as it never visited the site of the incident or the airbase from which the alleged attack was carried out, Permanent Russian Representative to OPCW Alexander Shulgin said. Washington is preparing an act of military aggression against the sovereign state of Syria by claiming President Bashar Assad is allegedly preparing the chemical weapons attack, First Deputy Chairman of the Russian lower house's Defense Committee Andrey Krasov told Sputnik Tuesday. Russia is not so much defending Syrian President Bashar Assad through its actions in Syria, but rather the Syrian statehood, Russian President Vladimir Putin said Friday. All conditions for the organization of visits by the experts of the Organization for the Prohibition of Chemical Weapons (OPCW) to the Shairat airbase in Syria to investigate the alleged use of chemical weapons have been created, the Russian Foreign Ministry said Thursday. Syrian President Bashar called the Idlib chemical attack in Syria "a cover up for the American intervention" in the country, which President Donald Trump intended to use to get support in his home country amid various conflicts with the members of the US establishment. At the end of the day, the United States and EU countries will silently admit that April's chemical weapons incident in Syria was little more than a provocation, Russian expert Lev Klepatsky told Sputnik. 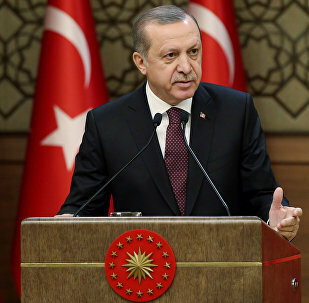 The president of Turkey said that the perpetrators of the Idlib chemical weapons incident must be punished. Russian Defense Ministry has dismissed a report issued by western experts from the Human Rights Watch on the alleged use of a Soviet-era chemical bomb in Syria as a "fairy tale." Paris has pinned the blame for the alleged chemical attack in the Idlib province on the Syrian government, but analysts say that the French investigation has not been unbiased. 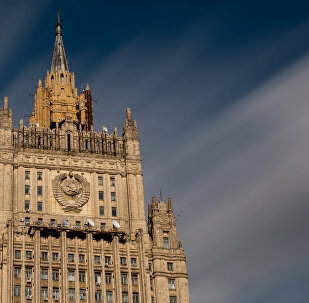 In an interview with Radio Sputnik, Professor Lev Klepatsky of the Diplomatic Academy of the Russian Ministry of Foreign Affairs described the probe as "a manipulation." Moscow hopes the Organization for the Prohibition of Chemical Weapons' (OPCW) will dispatch its "balanced" expert team to the site of a recent chemical incident in Syria as soon possible. A Sarin Attack Was 'Not in Assad's Interest', Why is France Pointing the Finger? In an interview with Sputnik France, a number of French experts cast doubt on their country's probe into the alleged chemical attack in the Syrian province of Idlib earlier this month; the document alleges that the attack bore the "signature" of Damascus. Chemical attacks carried by terrorists in Iraq and Syria were used to discredit Damascus and cast a shadow over Russia, according to the Collective Security Treaty Organization. Syria's Ministry of Foreign Affairs and Expatriates condemned the French claims of Sarin use in the April 4 chemical incident in Khan Shaykhun on Thursday as a "deception and fabricated lies." There are no obstacles for experts to visit the sites of the reported chemical incident in Syria and the airbase hit by US missiles, the Russian foreign minister said. Washington has not shared any data proving Damascus' involvement in the Idlib chemical incident with Moscow, the Russian foreign minister said.